I’ve often described the native inhabitants of Sweden as “persons of Swedish background”. This is not a joke — it’s an English translation of the official terminology employed by the Swedish state to describe the fair-skinned blue-eyed Swedish-speakers who made up all but a miniscule part of the Swedish population prior to 1970. What we used to call “Swedes” are now “persons of Swedish background”, just as Finns living in Sweden are “persons of Finnish background”, Somali immigrants are “persons of Somali background”, and so on. This nomenclature is a deliberate attempt to subvert the basis of society itself by distorting the language to change the way Swedes think about themselves. The oligarchs who govern the European region formerly known as Sweden are certain that they have the moral justification and legal authority to create the perfect multicultural state. Singling out a specifically Swedish identity as essential to the culture and integral to the state is a sin against Multiculturalism, and must be suppressed. “Swedishness” itself is to be devalued and discounted. To that end, the Swedish Parliament has voted to change the country’s constitution to reflect the new consensus. Since Parliament voted in favor of the change both before and after the latest general election, the revised constitution must now come into force in 2011. There is no going back. The Swedish constitution will be changed next year. The final decision in the Riksdag will be made on Wednesday, but since almost 95 percent of the MPs will vote yes, it is only a formality. To change the Swedish constitution you need two separate decisions in the Riksdag. Between the two decisions there need to be an election. However, since changes in the constitutions normally are the result of cross block border negotiations, it is difficult for the voters who are against the changes to do anything about it at the election that separates the two parliamentary votings. All seven parties that had seats in the Riksdag last electoral period voted in favor of the changes in the first voting in June this year. Only the Sweden democrats, elected to parliament for the first time this September this year, will vote no in the second voting next week. The Riksdag shall vote about the Prime Minister after every election. Today, if there is an unclear parliamentarian situation, the government can continue to govern and it is up to the opposition to call for a vote of no confidence and force them to resign. The Swedish membership of the EU becomes a part of the constitution. It will be written in the constitution that the ability of Sami- and other ethnical, linguistic and religious minorities to keep and develop their culture shall be promoted. So the EU has been written into the constitution, foreigners may hold high office, and ethnic separateness will be officially promoted. The newly drafted Swedish constitution has declared that the Saami are no longer an ethnic minority but a fully-fledged people. While the wording of the agreement sheds little light on the new implications for international law, most legal experts agree the move will theoretically strengthen the rights of the indigenous Saami. The issue has been a bone of contention since an earlier draft of the new Swedish constitution listed the Saami as an ‘ethnic minority’, triggering widespread condemnation from the country’s indigenous community, reports Siku News. The choice of the Saami (or Lapps) as poster children for the Multicultural Utopia is no accident. The Saami have lived in Sweden for thousands of years, since before the ancestors of the Swedes arrived. They are non-militant, picturesque, and pose no threat to the political order. Who could object to the Saami? The multicultural Trojan Horse has been painted in the likeness of a Saami family with reindeer and colorful costumes so that it may sneak in with all the Somalis, the Albanians, the Iraqis, the Afghans, and all the other barbaric Muslim peoples now arriving in Sweden by the tens of thousands. The Saami are being singled out for protection to help prevent any attempt to discredit the institutionalization of Sweden’s suicidal multicultural policies. The main point, however, is that Sweden’s EU membership has become part of the Swedish constitution along with multiculturalism. That’s what the new text is about — affirming Sweden’s status as an officially multicultural EU member state. Swedes, of course, have neither. Moderaterna (the Moderates) is the ruling party in Sweden, although it governs together with other center-right parties in a parliamentary coalition. Jimmie Åkesson and Kent Ekeroth, two leaders of the upstart anti-Islamization Sverigedemokraterna (the Sweden Democrats) recently wrote a debate article for SVD. In other words, they’re making it easier for immigrants to gain political power, and are stating it proudly and openly. Welcome to the all-new multicultural Nordic paradise! We hope you enjoy celebrating diversity with us! So, foreigners without Swedish citizenship are now going to be able to be Swedish government ministries? Compare that to Switzerland, where if a Swiss dual citizen would like to work as an accountant at a Swiss embassy or consulate, the non-Swiss citizenship has to be renounced beforehand... 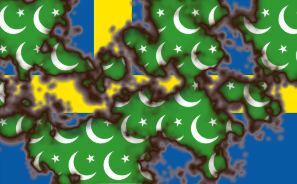 I wonder how long it will take until Mona Sahlin's monkeys decide to change Sweden's name to the Nordic Sharia Sultanate, or Scandinavian Arabia. There is always this if you want your children to benefit from the new institutinalized promotion of other cultures, colors and creeds. Notice how white Swedish males are racist Nazis. If 'a' allows 'b' to take advantage of him who's to blame? A most detailed survey/outline of the new Constitution or Fundamental Law (Grundlag) of Sweden and its consequences can be found at last Sunday's 'Snaphanen.dk' titled 'A Completed Treason'. It is written by the masterly "Julia Ceasar", a pseudonym, necessary to carry if not to become a victim of reprisals from the authorities, the sociey and all political opponents. "Julia Ceasar" has written two books about the brainlessly carried out massimigration to New Sweden, the Multi-Culturalism that from 2011 is sanctioned in the new Fundamental Law and the Swedish utterly failed brave new society model. Both books should be necessary reading for all having a command of a scandinavian lingo, especially anti-PC-debaters like Fjordman et al. I find it so difficult to fathom out what is going on in Sweden. When you read there history they were as nasty a set of people as you could ever wish to meet. During the 30 year war they invented waterboarding well before the CIA thought about it, it was referred too as the the Swedish drink by the Germans, who mainly had to suffer from it. It consisted of pouring a mixture of urine and cow dung down the peasant throats until they told them where they were hiding food or there wealth. Until well into the last century in Germany your didn't threaten a naught child with the Boggie man you told him if he didn't behave the swedes would get him. This is not a new Swedish Constitution it is a death sentence. One of the things that I have notice is that Sweden accounts for near 4% of the hits on the British National Party site they are by far the highest not in terms of numbers from abroad but in the percentage of the population of of the different countries from abroad. America is the highest with over 9% but the country is 30 times larger than Sweden, this means that there are 15 times more Swedes reading the BNP, than there are Americans per head of population. Is there this large suppressed class of Nationalistic Swedes slowly stewing in there own impotency that we don't hear about, I find it macabre and slightly frightening, I would like a comment from any Swede reading this as I just don't understand what is happening there. Yeah, they are referred to as Nazi Lars. Anybody else protective of their own culture is advancing multicultural paradise and their wonderful conttributory culture and values. When Swedes do it, they are called Nazis and Racists. While the grand idea of Multiculturalism is value and cultural neutral, the implementation is anti Host culture and peoples. The problem is that when the host culture and peoples wake up to this, and it will likely be late in the game, the results are going to be really ugly. Instead of nipping it in the bud, with much less ugliness to sort out the insanity. Once again the base culture is ignored by the multicultural self proclaimed elite, and once again the citizens are starting to fight back. Given the history of Sweden if I was one of the people who are trying to destroy the Swedish culture I would be very worried. In translation: a 15 - FIFTEEN - year old boy had to pay a fine of 200 swedish crowns for directing an "oink" sound towards a police officer (you know, them being pigs). It is equally illegal to use the term "blatte" when referring to an immigrant (it is a slightly offensive slang) but if immigrants use the slightly offensive term about swedes, "svennar" it isn't a big deal. The only comfort in all this? Nobody has actualy been found guilty of this crime. yet. Why? because (according to my social studies teacher) it is a slippery slope, if one can be found guilty for it, soon thousands of others will. The point im trying to make is: people are afraid to say s***, not just because they might get beat up by a pack of pakis or be the first one to get charged for it, but because we control each other. If you go about bandying out that you voted for the sweden democrats you will be considered a racist scum, by EVERYONE. Sweden is so adept at being neutral pretty much every major political party is centered around the middle, even though the left and the right blocks are separated their politics don't differ all that much. Thats why parties such as SvD are labeled "right wing extremism". Oh, and one more thing: it is widely known that most (if not all) newspapers in sweden are politically coloured. We know we are being spoonfed bulls*** and propaganda, me and my friends talk about it, but it pretty much stays there because there is nothing you can do about it, you can have an opinion, just make sure nobody knows it's not the "right" one. I do think there's a large suppressed group of Swedes that support the Swedish Democrats, much larger than the average Swede thinks. What's happening here is that even now with the Swedish Democrats elected into office people are afraid of showing their support for them in public, because of their fear of being seen as a racist by their community. Particularly the media are responsible for creating this witch hunt on Swedish Democrats in the name of multiculturalism. This creates a lot of anger and frustration among the supporters, as they feel it is unjustified. Many of them aren't racists at all, they just want their concerns taken seriously. The support for this new party grows every day, partly because many Swedes feel they are being robbed of their identity and culture, that we have to adjust to the 100,000 immigrants that come to Sweden every year and not the other way around. Heck many schools can't even celebrate the end of spring semester in church any more, as the muslim community don't want to enter a church. I've even read articles that question our tradition of singing the national anthem on the same occassion, as some minorities might be offended. People are starting to get fed up and a lot of people that thought of voting for the Swedish Democrats in the last election but didn't, they probably won't make the same mistake in 2014. In a recent school election in Jönköping, the Bäckadalsgymnasium, the Swedish Democrats recieved 45% of the votes. In Sweden on average SD recieved 13% of the votes in the school election. These are all young people that will get to vote in the next election, and if the politicians and the media continue on their current path, I won't be suprised if SD get 20% of the votes in the next election. Now with the recent suicide bombing in Stockholm, the first ever in Sweden, people are starting to wake up to reality. Daniel, the SD are the most popular among 18-21 years olds and then among 18-30 years olds. This is the opposite of Americans, where the younger, the more leftist they are. Anyway, anybody who thinks that having the passport of a certain country makes you Swedish, Norwegian, German or Italian is foolish. I suppose this works only in the US, where everyone can be American.